(b) Read this post and see if it will help your children in learning. During school holidays, I am more lenient to the students; they may read more story books. As long as the students learn some vocabulary, I allow some fun in my class. For this case, the student made the request to do arts work and with the permission from the mother, we had an English class without a book. Despite “without a book”, the idea comes from an English book where there is a passage on using the unwanted materials to build a toy city. The purpose of the passage is to encourage people to recycle. But the book is not needed as the steps are easy to follow. The student is creative and a hands-on person. Thus the session suits him well. The first step is to plan the city with all the boxes available. The boxes are the buildings of the city. 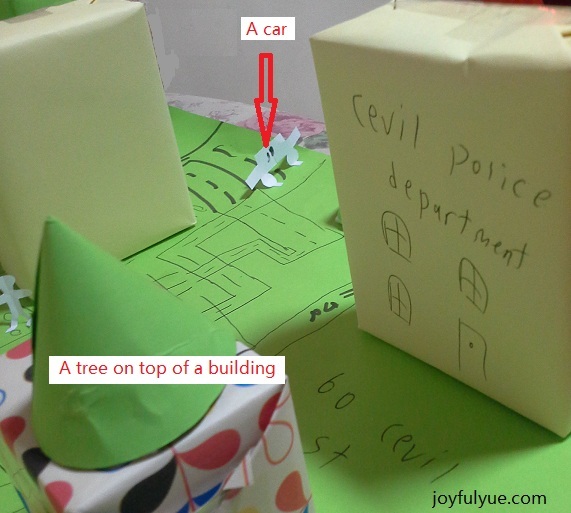 Due to limited space and boxes, the student needs to think of what type of buildings he wants in the city. In this process, he learns how to plan and also how to spell library, university, police station, HDB flats, coffee shop and etc. What surprises me is, he even thinks of the name of the roads. I also like his idea of building a student care centre near a university, a pub near a police station, and a drug company to poison the citizens! 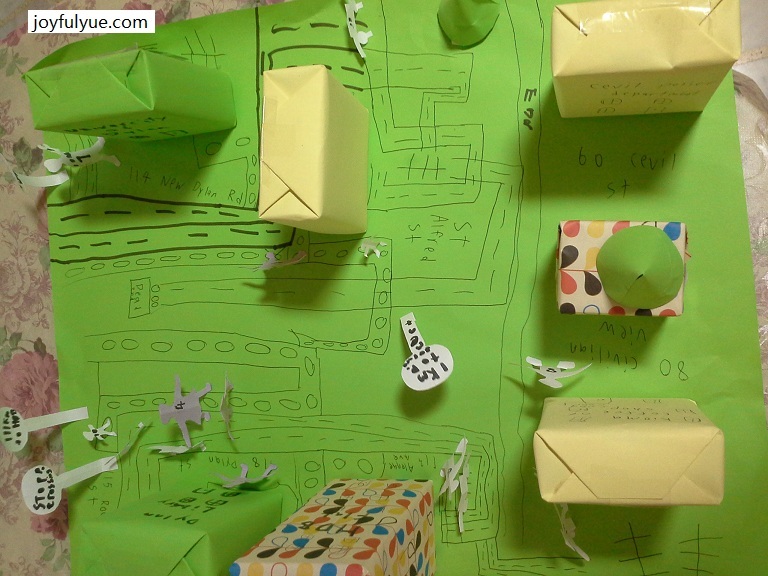 The second step is to wrap each box, label it and put it on the “city”. Along the way, you may need to change the city planning. As an example, I told the student that he has planned the city well with a library and a university, thus a drug company may not be necessary (The reason behind is we run out of boxes for the drug company). For younger children, please beware when they are using the sharp instruments, you may want to give them a helping hand. The final step is to add in some other details. As you can see from the pictures, there are trees, people and sign boards. These are not in the book. The student has suggested adding in benches too. But we did not find out how to make a 3D bench. 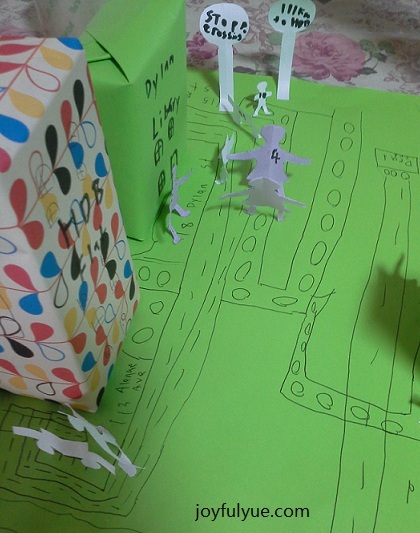 This final step is suitable for older children when they have a better idea how a city look like. You may want to skip this step for younger children. Children have wild imagination, let them decide what kind of city they want. Even though there is no book, they learn how to plan, how to spell and you also can discuss with them why they choose certain buildings or certain colours. From the discussion with your children, you also know how they think. It is a lesson that combines arts, language, (city) planning, science (what type of plants they want) and recycling. Best of all, it is a toy when it is ready! If your child is also a hands-on person, why not give him / her a fun English session? By Wendy in Languages on 06/12/2013 .